JUNE 2nd AT GERLADINE’S? SAY YES! Join us for some sweet soul music Thursday, June 2nd! 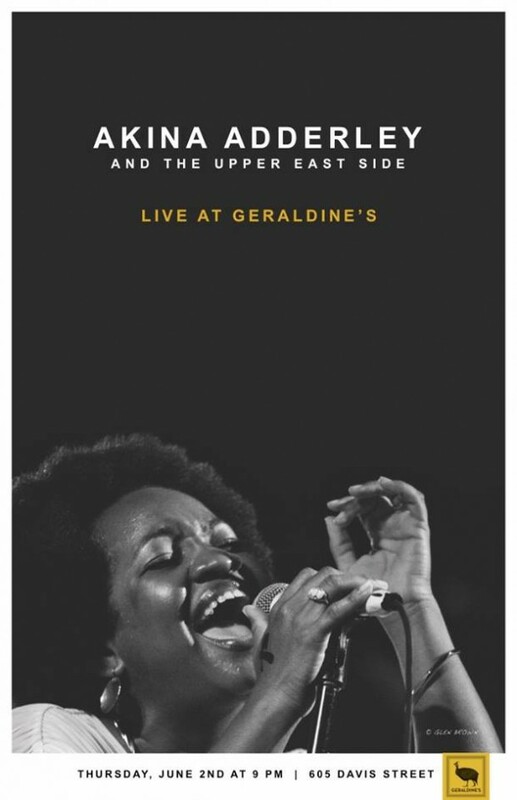 Akina Adderley and The Upper East Side are playing a special show at Geraldine’s, the gorgeous new venue on the 4th floor of the Hotel Van Zandt. Swanky but comfortable, delicious food and classic drinks, and best of all, it sounds beautiful in there. See you next Thursday! Please confirm on facebook so we can gage attendance and plan well. Listen to a clip here while you RSVP! The Austin Music Minute first got word of the fabulous Akina Adderley through her music with The Vintage Playboys. But those incredible, electrifying performances were just the tip of the iceberg. Music is party of her rich family history, coursing through her veins, a living, breathing part of her DNA, morning, noon and night. It’s only natural, of course; the family tree boasts renowned jazz musicians Nat Adderley and Julian “Cannonball” Adderley, her grandfather and granduncle, and father Nat Adderley, Jr., jazz pianist and former bandleader for Luther Vandross. Akina Adderley is a standout in many areas of music: Fierce front woman, songwriter, collaborator, backing vocalist and educator. While dividing time between her own bands – The Vintage Playboys, Nori, the Upper East Side – she performs with a myriad of well-known artists, including Gary Clark, Jr., Alejandro Escovedo and Booker T. Most recently, she’s written and performed with Charlie Faye and Betty Soo (Charlie Faye & The Fayettes), and contributed her talents to a spectacular Prince tribute at Antone’s. And several budding musicians hold Adderley in highest regard as voice instructor and band coach at Girls Rock Camp in Austin. But really, these are only a few of Adderley’s accomplishments. The best is yet to come. Treat yourself to a grand evening tonight, when Akina Adderley and the Upper East Side perform at Geraldine’s, located on the fourth floor of Hotel Van Zandt, 605 Davis St.
Soak in all the soul. The music starts at 9:30 p.m. Very recommended.